After a short stopover at Falmouth we left in the early hours bound for the Isles of Scilly. We had a wander around the town, ate fish and chips at Rick Stein’s ‘Fish’ restaurant and, still pretty tired from the 34 hour sail from the Solent got our heads down at around 9pm. The chap who assigned our berth the previous afternoon (after sailing from Yarmouth) expressed consternation that we were attempting it. He claimed 40 knot winds were coming in from Biscay and this had thrown us all as we’d not been expecting this. We checked and re-checked every source and couldn’t find anything to support this but it was a good wake up call to be rigorous. 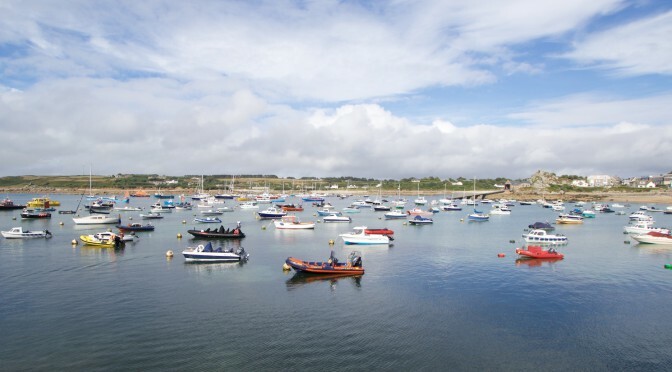 The pilot book for the Isles of Scilly was very clear not to attempt the crossing if the sea state was rough. Lou was skippering this passage and together we took the first watch. We’d had some debate over what time to leave – the Germans rafted to our outside had said they were leaving at 0100 which would be text book following the pilot book to catch the fair going tides. Our primary goal was to make the Isles of Scilly in daylight – we much preferred avoiding a night time pilotage in unfamiliar waters. Joe was up with us to help with lines and after hoisting the main went back to bed as we made our way down the Fal. At around 0300 we approached the Manacles (a group of rocks marked with an ECM about halfway between Falmouth and the Lizard) we spotted a lone green light 200m to starboard. We were sailing beautifully on a beam reach and as something to do I checked the AIS. It was marked ‘Liberty of Essex’. I knew the crew of Rannoch Women’s Challenge were going to be finishing some time this week but to stumble across them on their final approach was amazing. 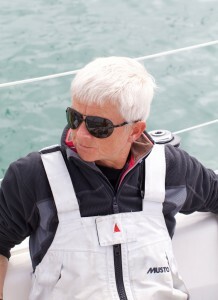 I’d heard of them initially, because I’d met 3 of their crew during my Sea Survival course in with Sailing Logic in May. I’d been tracking them via their Facebook page and Yellow Brick tracker since they set off. 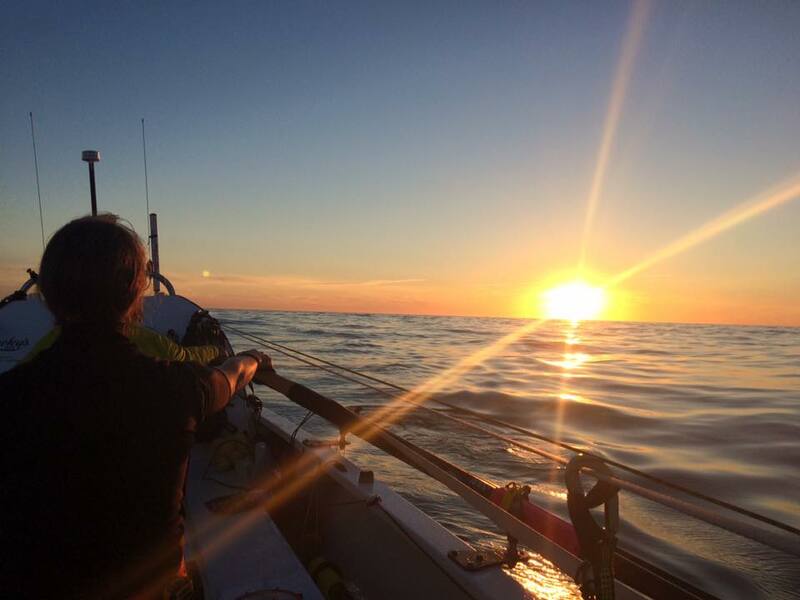 They were the first ever female crew to row across the Atlantic from west to east and did this in 48 days. And there’s me thinking 34 hours from Yarmouth had been an achievement. If we’d been under engine we might have popped across to say hello and I resisted the temptation to shout across the water. This would have been difficult to hear, could be misinterpreted (pirates?) and I was sure they wouldn’t have connected the dots as to who was hollering – so I resorted to a Facebook post. The rest of the crossing to the Isles of Scilly was fairly uneventful in terms of stumbling across record breaking attempts and after I went down for my off watch I was aware of the chop as we rounded wide of the Lizard. Timothy Spall made a big deal of the over falls in his series Somewhere at Sea. We tacked as we passed around Lizard heading roughly in the direction of Mousehole, a beautiful drying harbour I visited with family last year. Another tack at around 0800 and we started back on a SW direction. The wind, though, had been forecast W/NW but it wasn’t really going NW at all. We were being forced further south than we wanted and mindful of our primary objective of making landfall well before dusk we decided to motor sail west across the traffic separation scheme hopeful that the wind would veer and we could sail the final leg into the Isles of Scilly. It didn’t though but it was a good exercise for one of the crew to shape a course to our pilotage waypoint just off Peninnis Head (pronounced carefully) at Saint Mary’s. As we rounded Pool Ledge we were able to pick up a great transit into St. Mary’s Pool and find a mooring. It would have made sense to have done a mooring recce as we ended picking the one further from the tender landing dock – the downside being for one of the crew who did all the rowing ashore. 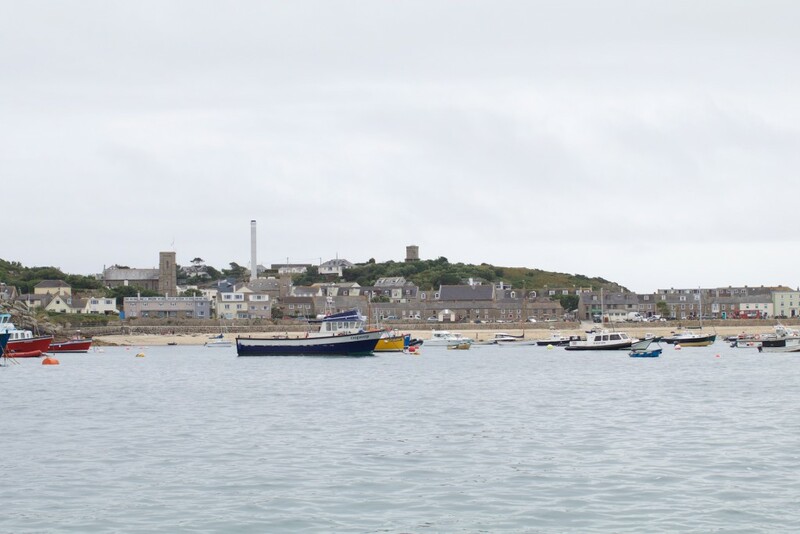 We were due to spend a couple of days in the Isles of Scilly before departing on our final leg to Brittany.